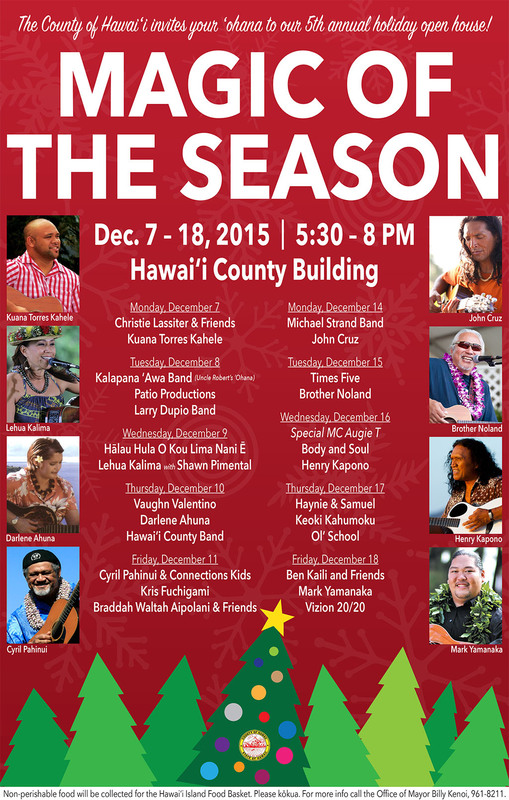 The County of Hawai’i is proud to present its annual holiday open house festivities in Hilo and Kona. The fifth annual Magic Of The Season at the Hawai’i County Building in Hilo will run weeknights December 7 to 18, 2015. Festivities will run 5:30-8 p.m. nightly with free entertainment, activities, and refreshments hosted by your County departments. Henry Kapono, Mark Yamanaka, Darlene Ahuna, Lehua Kalima, John Cruz, Brother Noland and Kuana Torres Kahele will be among the Nā Hōkū Hanohano award-winning performers. Hula dancers, student musicians, and also the Hawai’i County Band will take turns entertaining audiences. For a detailed schedule, please download the event poster below. County volunteers have decorated dozens of trees and lit up the Hawai’i County Building. 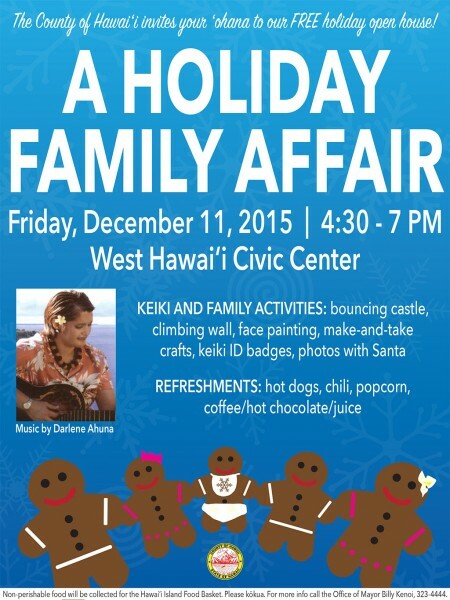 Members of the public may view the decorations daily starting at 7:45 a.m.
At the West Hawai‘i Civic Center in Kona, families are invited to A Holiday Family Affair on Friday, December 11 from 4:30 to 7 p.m. featuring entertainment by Darlene Ahuna. 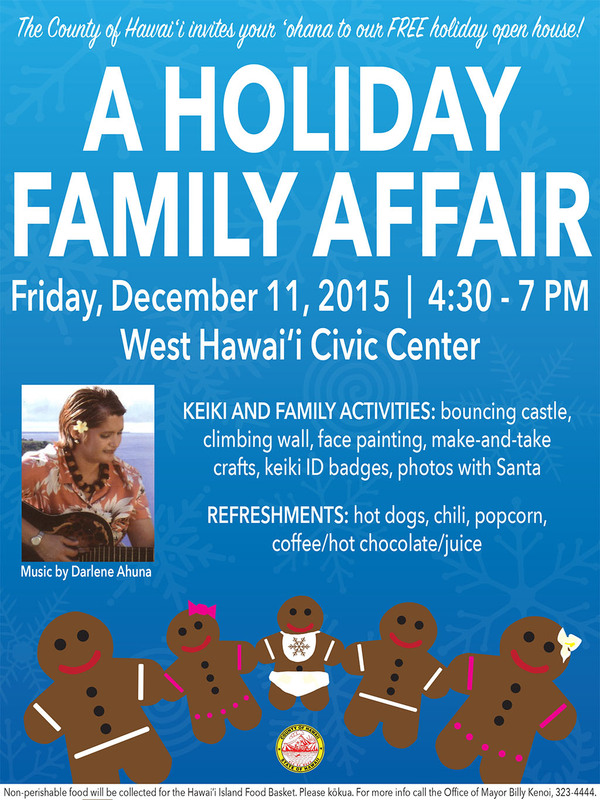 Activities include a bounce castle, a climbing wall, face painting, make-and-take crafts, keiki ID cards, and photos with Santa. Refreshments will be served. Donations of non-perishable food items will be collected at both events for the Hawai‘i Island Food Basket. Please kōkua. For more details, please contact the office of Mayor Billy Kenoi in Hilo at 961-8211 or Kona at 323-4444.